We supply artificial grass to homeowners throughout Scotland who are looking for artificial grass of the highest quality from an experienced team who can carry out installation quickly and efficiently, without fuss at competitive prices. Artificial grass makes a fantastic addition to your garden as it looks great as well as saving you time and money on garden maintenance. You get a garden that requires no lawn-mowing, no fertilising, and no watering, leaving you free to enjoy your time in the garden with your family. The artificial grass surface is safe and comfortable for children to play on. Even on those wet days that would usually transform natural grass into a muddy mess your children can run around without you dreading them dragging mud back into the home. Artificial grass is a great solution if you have pets, particularly dogs, running around in the garden most days. You don’t have to worry about them getting muddy when the weather is wet and your lawn will stay looking great as artificial grass provides a tough and durable surface. Artificial grass is durable and hard wearing, so you won’t have to worry about bald patches or having to replace it after a short time. 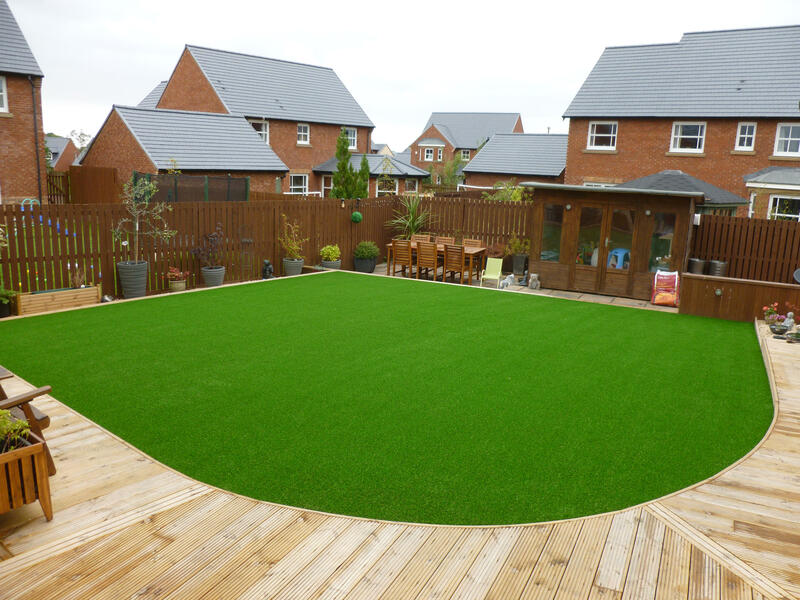 Whether you have a young family of children playing in the garden every day or you regularly entertain friends and use the garden for barbecues and socialising, artificial grass can stand up to the rigours of family life for many years. Although artificial grass is fantastic when used as a simple lawn, it has a number of other applications for homeowners. Artificial grass is a fantastic sports surface, it has been frequently utilised in home gardens as a putting green surface to get in hours of practice in the comfort of your own garden, it has also been installed with the intention of creating a mini football pitch for youngsters to practice. Artificial grass has also been used in a variety of unconventional areas in the home such as balconies or roof gardens that would not be able to use natural grass. It has even been used inside homes, particularly popular as carpeting in children’s bedrooms who want to create the football pitch feel. Our team of artificial grass specialists seek to understand each customers specific requirements for their home and find the artificial grass that suits them best. Installation is undertaken at a time that suits you and will be completed in a timely and professional manner so as to minimise disruption while maintaining our high standards.